01-015.4C Stage 4 Ceramic Performance Clutch Kit: Jeep CJ - 10-1/2 in. This is a Phoenix Friction Stage 4 Street Performance Clutch Kit. This kit features a High Clamp Pressure Plate and a Phoenix Friction high heat Ceramic spring dampened disc. It will provide up to a 80% increase over the stock engine torque capacity. At the same time, you will only notice a slight increase in pedal effort over the stock clutch and offers chatter-resistant lift-off for a great daily ride. Our Ceramic button discs will give you the fastest shifts due to their low radial mass which reduces their overall flywheel effect and works with all flywheels, including lightweight steel and aluminum. You can expect 200% the life over original equipment woven organic linings from Ceramic buttons under normal driving conditions. These buttons will absorb the most energy of all the friction materials and is the material of choice for the highest torque applications. A Phoenix Stage 4 Street Performance product is a direct factory fit and requires no modifications for installation. 10-3/8" x 10T x 1-1/16"
Refer to the technical bulletin TB006 regarding the need to make sure that the release bearing and the clutch fork match properly. 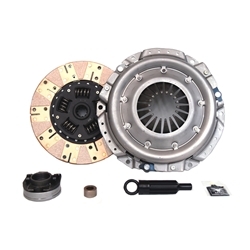 Technical Bulletins are shown to provide you with additional information that may affect the installation of this clutch part in your vehicle. The bulletin does not indicate that the part you are looking to purchase is compromised in any way. These bulletins are often generated by the original vehicle manufacturer or the original clutch manufacturer and are intended to make the installer aware of issues that may affect the performance of the clutch system. CRP116 Clutch Mounting Bolt Kit: 3/8 in.-16 x 1 in.